Synopsis : Once there was a Postman who fell in love with a Raven. So begins the tale of a postman who encounters a fledgling raven while on the edge of his route and decides to take her home. The unlikely couple falls in love and conceives a child - an extraordinary raven girl trapped in a human body. The raven girl feels imprisoned by her arms and legs and covets wings and the ability to fly. Betwixt and between, she reluctantly grows into a young woman, until one day she meets an unorthodox doctor who is willing to change her. One of the world's most beloved storytellers has created a dark fairytale full of wonderment and longing. 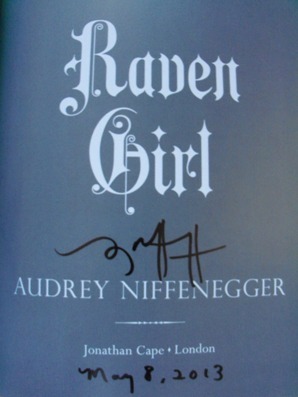 Illustrated with Audrey Niffenegger's bewitching etchings and paintings, "Raven Girl" explores the bounds of transformation and possibility.